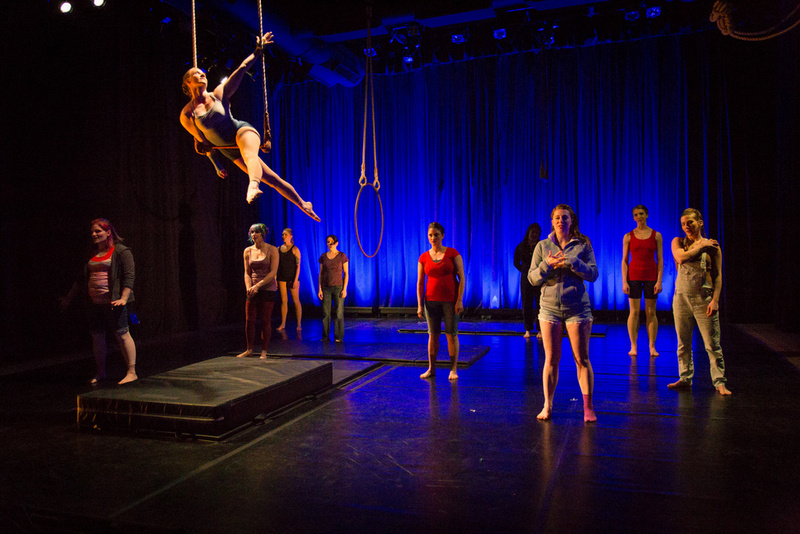 Recent trapeze performance in Tangle’s show RetroAct! Last month marked my third year joining inspiring Philly circus company Tangle in their spring show; this time, I performed a solo static trapeze piece in RetroAct. I was in a short arm cast for the month of March (no broken bones; its purpose was to heal instability in my right wrist — the reviewer quoted above accidentally listed it as the left wrist), but this limitation may have inspired me more than any particular ability has in the past. The creation and rehearsal process excited and exhilarated me as I trained hands-free skills I’d never considered before and learned to navigate transitions one-handed. I was so excited to be performing an act on the same technical level as any of my past aerial work, to be executing surprising and original movements in the air, and to showcase the ingenuity and determination that can allow a person to do what they love even when one of their primary tools is taken away. A fiberglass cast is such a clear indicator of injury: instantly recognizable, obviously not worn by choice, and 100% preventing use of the encased body part. Performing in it sent a definite message and felt like a definite victory. Photographers and reviewers all came on the first night of the show, and I’m so glad to have these lovely photos and kind words! Between the first and second shows, I was drilling a sharp twisting move (front balance, half twist to ankles, hands-free) that hadn’t gone as well as I wanted — and I partially tore an oblique abdominal muscle. Warming up before show two, I discovered that every movement in my act hurt, many caused stabbing pain, and several I couldn’t convince my body to execute at all. I might have gotten through the act on stage with adrenaline and determination … and I probably would have injured my abdominal muscle further, prolonging recovery by months. And so, this act that I created to perform even while injured: I couldn’t perform it due to injury. I had to sit out of the second show because of a plight that, in contrast to the arm cast, was invisible and only partially disabling, that required a judgment call and offered no external evidence of itself. I was heartbroken. In the spirit of circus and community and finding ways of working around our injuries in order to safely do what we love, we created a different kind of piece for you in its place, and you today are the only audiences who will get to see it. A definite victory after all — and one that I hope might inspire other artists to adapt and flourish under whatever conditions they may find themselves in.